Remembrance Ed Givler of Rockland January 31, 2019. Caring, creative, loving, loyal son, brother, husband, uncle and friend. 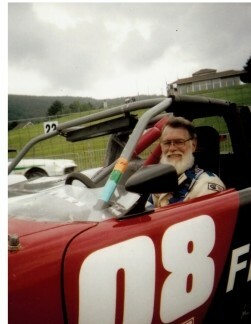 Ed was a skilled engineer, race car designer, builder, championship driver, long-time member of the Sports Car Club of America, winning Northeast Division Championships in 1973 and 1980. Award-winning skier and, for over 50 years, a member of National Ski Patrol, most recently with the Blue Hills Ski Patrol where he was the recipient of the Jack Kraft Award. Ed’s early love of skiing took him to Colorado, where he polished his technique, operated lifts, and served as the night watchman at Arapahoe in exchange for room, board and free skiing, completing his engineering degree at the University of Denver. Coming back East, he worked at the MIT National Magnet Lab and was the co-author of a scientific paper on magnetomyography in 1972. Ed was mostly quiet and reserved, but fiercely determined and highly competitive in the best spirit of sport. Never a bully, he was happy to share his considerable expertise in every arena, work or play, wanting others to enjoy enthusiasm for whatever project was at hand, and there was always another project around the corner. After retiring as the Chief of Biomedical Engineering at the Brockton/West Roxbury Veterans’ Administration Hospitals, Ed worked on the 2000 Census, then gathered his high school and college transcripts and enrolled in a Computer Sciences course, earning his degree with excellent marks and induction into Phi Theta Kappa honor society. Other projects included continued work on his race cars, with a COMSCC fast time of the day win in 1999, rebuilding a deck single-handedly, Ski Patrolling, skiing with friends in the west, and seeing his nephew properly bitten with the racing bug. Life changed dramatically with a diagnosis of Parkinson’s Disease, but Ed met every challenge with grace and maximum effort. He participated in studies and programs to ameliorate the effects of the disease and to provide information for researchers and others with Parkinson’s. He was the subject of an in-depth Boston Globe article by gifted reporter Patricia Wen and her team in 2009. Ed will be missed deeply by his wife of 44 years, Kathy, his sister, Joyce and her husband, Tom, sister-in-law, Eileen, niece Kristen and her family, nephew Michael and his family, nephew Scott and his family and a host of extended family and friends from coast to coast, all of whom have cited Ed’s kindness and goodness among his many memorable qualities. A celebration of Ed’s life will be held in the spring. Donations in memory of Ed may be made to the Michael J. Fox Foundation, the Shriners Hospitals for Children, or any charity of your choice.